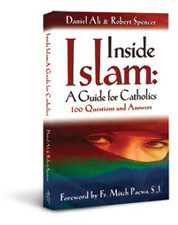 Below are excerpts from the still-timely book Inside Islam: A Guide for Catholics, written by Daniel Ali and Robert Spencer (who recently participated in a debate with Monsignor Stuart Swetland on Relevant Radio's Drew Mariani Show; click here to read Mr. Spencer's account of the debate). The book's foreword was written by Father Mitch Pacwa, S.J. Thanks to Matthew Pinto of Ascension Press for permitting me to publish these excerpts in my column. Click here to order a copy. Islam glories in the clear simplicity of its doctrine and demands. The faith of the Muslim can be understood by the least educated person, and the religion offers a promise of eternal happiness in a paradise appealing to the senses. Muslims criticize Christianity for a number of reasons, but chief among them is that Christianity is too complex a mystery to be true. Furthermore, the belief in a heaven where the blessed see God face-to-face seems blasphemous to the Muslim. Despite Islam's profession of a simple, clear faith, this religion is not well known to most Westerners. The media presents many news stories about Muslims without offering any real explanation of Islam and its tenets. Rarely does one encounter an article or program which explains the essential differences between secular Arab nationalism and Islamic religious movements. Many Western Christians remain unclear about the differences between the various Muslim sects: How do Sunni and Shiite differ? What are Wahhabi Muslims? Since the conflicts in the Middle East have involved America in two wars and terrorism has inflicted horrors upon our own shores and abroad, the sale of the Koran in its English translation has greatly increased in the United States. Many American Christians want to better understand Islam but find that the more closely they approach this enigmatic faith, the more complex it seems. Since the Koran is not organized chronologically or thematically, it is difficult for the non-Muslim to make sense of it. The Koran appears so strange to Western eyes that many readers find it difficult to find a firm starting point to read it with comprehension. Another problem in understanding Islam stems from the many conflicting ideas existing within it. Is it a religion of peace or a religion of warlike jihad? Does jihad mean the individual struggle to submit to God more completely or does it refer to the universal struggle against every non-Muslim society and structure? If Islam teaches so many good things about Jesus Christ and the Virgin Mary, why do Muslims have so many difficulties with Christian beliefs? The committed Christian, then, is faced with a central question: Does the choice between Islam and Christianity make any difference in living life on earth or achieving eternal bliss in the next life? Both Islam and Christianity claim to be God's true revelation, so how does a Christian respond to Islam's claim? Is there a way to sift through the Koran, pull together its themes of revelation, and make sense of it from a Christian perspective? Though Muslims are actively seeking converts from among Christians, is it possible to evangelize Muslims about Christianity? How can one begin to discuss the issues which separate the two religions? I commend the authors of this book for helping Catholics tackle this most important topic. They have presented many of the key beliefs of Islam in a clear question-and-answer format. Their deep insights into the text and language of the Koran are truly enriching, especially for the relatively new student of Islam. Though unabashedly Christian, Daniel Ali and Robert Spencer have chosen to treat this world religion and its believers with the respect they are due. First, Muslims are recognized as persons who truly want to please God by submitting to Him, and their commitment and sincerity are respectfully presented. Second, a great wealth of information from Islamic sources – the Koran, Muhammad's Tradition (the Hadith), and the opinions of Islamic scholars – is presented and discussed extensively, with source citations provided so that the reader can personally examine the texts. And third, they take the claims of Islam seriously, as is proper for a religion which has changed the lives of hundreds of millions over thirteen centuries and across many cultures. Islam claims a divine origin for its revelation, so its texts must be read from the point of view of such a high claim. This respectful attitude towards Islam involves a process of serious, careful attention to the data of Islamic revelation. However, the authors also note the difficulties, tensions, and contradictions within the Islamic literature precisely because they take it so seriously. Daniel Ali had to face these difficulties personally – though once a believing Muslim, the tensions he began to see within Islam became such a weighty challenge that he was moved to increase his study of Islamic texts until he eventually came to accept that Jesus Christ is the true Son of God and Lord of all. Having heard Mr. Ali speak many times, I am again deeply impressed at his brilliant insights into the many difficulties presented by the Koran. His deep understanding of its language and careful examination of the Arabic vocabulary help the non-Arabic-speaking Christian follow the arguments about its claims to be the reliable, perfect, inspired word of Allah. His co-author, Robert Spencer, also comes to the project with an extensive knowledge of the religion of Muhammad, having written [several] books on Islam. Mr. Spencer's background as a Catholic apologist and teacher has served this present book well. Inside Islam: A Guide for Catholics is especially for those Christians who want to submit to Jesus' command to make disciples of all nations. This book is definitely not for the timid or indifferent Catholic. It is for those who truly want to explore the mystery that is Islam, so that they might be better prepared to proclaim the saving truth of Christ to their Muslim neighbors. No one who is beginning to confront the reality of Islam should be without this book. May God bless all who read it. 86. Given Islam's teachings on jihad, how can Muslims claim it is a religion of peace? When the Muslim declares that Islam is a religion of peace, he is either ignorant of the Koran or is extending this "peace" only to those within the Muslim community, without telling you that is the way he means it. According to the Koran, "Muhammad is the Apostle of Allah. Those who follow him are merciful to one another, but ruthless to unbelievers" (Sura 48:29). Muslims are to greet and treat other fellow Muslims in a manner promoting peace within the Umma, or worldwide Muslim brotherhood. In Islam, there exists no true concept of peace between the nonbeliever and the devout Muslim. Peace can only exist for those who follow Islam. 87. Are suicide attacks by terrorists in the name of Islam justiﬁed by the Koran? Opinions on this point differ among Muslim scholars. Some condemn suicide attacks on the basis of Sura 4:29: "O ye who believe! Eat not up your property among yourselves in vanities: But let there be amongst you traffic and trade by mutual good-will: Nor kill (or destroy) yourselves: for verily Allah hath been to you Most Merciful!" Therefore, when ye meet the Unbelievers (in fight), smite at their necks; At length, when ye have thoroughly subdued them, bind a bond firmly (on them) . . . But those who are slain in the way of Allah, He will never let their deeds be lost. Soon will He guide them and improve their condition, and admit them to the Garden which He has announced for them (Sura 47:4–6; see also Sura 3:157). If a wound hath touched you, be sure a similar wound hath touched the others. Such days (of varying fortunes) We give to men and men by turns: that Allah may know those that believe, and that He may take to Himself from your ranks martyr-witnesses (to Truth). . . . Did ye think that ye would enter Heaven without Allah testing those of you who fought hard (In His Cause) and remained steadfast? Ye did indeed wish for death before ye met him: Now ye have seen him with your own eyes, (And ye flinch!) (Sura 3:140–143). On the basis of these and other similar passages, the foremost cleric in Sunni Islam, Sheikh Muhammad Sayyid Tantawi, the Grand Sheikh of Al-Azhar University in Cairo, "emphasized that every martyrdom operation against any Israeli, including children, women, and teenagers, is a legitimate act according to [Islamic] religious law, and an Islamic commandment." It seems clear that Tantawi's view is held by many in the Islamic world, judging from the events of recent history.